There now. 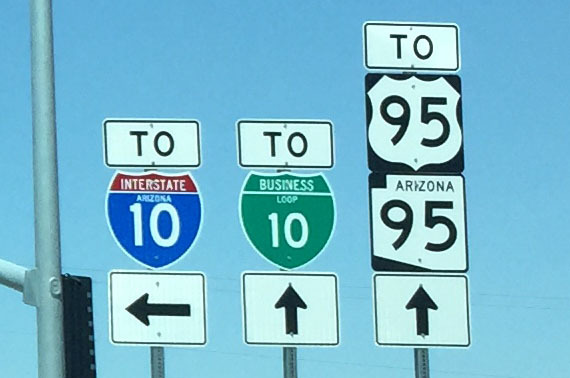 Let’s get in the car and check out a fun Saturday road trip destination about 3.5 hours west of Phoenix. In 1958, there was not much to see in the Mojave Desert at the Arizona-California state line. From a barren wasteland, a man named Robert P. McCulloch had a vision: He wanted to build a city. He purchased 3,300 acres of land on the east side of Lake Havasu on the Colorado River and planned it out for 4 years. Later, he picked up another 13,000 acres. 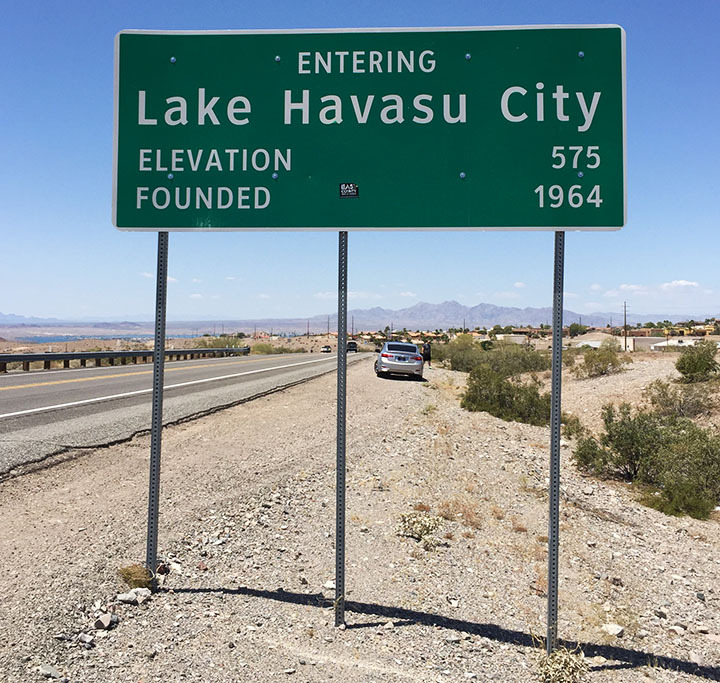 Lake Havasu City was established in 1963, incorporated in 1978, and continued to develop in the ensuing decades. Today, LHC is home to about 52,000 people. 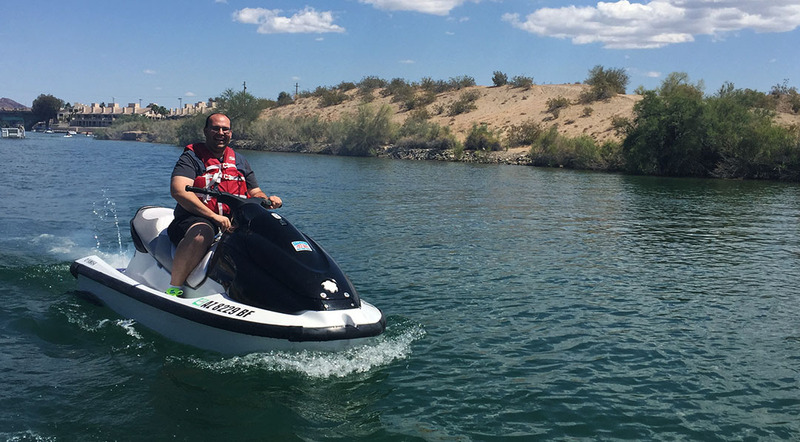 It’s a popular destination for spring breakers, water recreationalists (I just made that word up), and snowbirds who escape the winters up north and park their fifth-wheel trailers for a few months in Arizona every year. One of the city’s biggest attractions is a 930-foot-long stone & concrete bridge that was once a critical piece of infrastructure way across the Atlantic, in England. From 1831 until 1967, this bridge spanned the River Thames in London. But Robert McCulloch wanted so badly to bring a “centerpiece” to his newly-founded community that he purchased the entire bridge from the city of London and had it transported, piece by piece (they were numbered to keep them in order), to western Arizona. It took three years to re-build the bridge in its new location, and it opened for traffic in 1971. 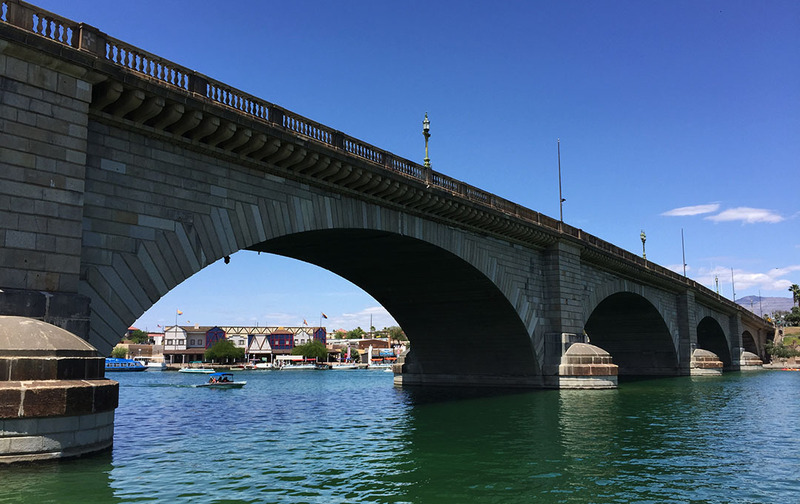 It connects a small island in the Colorado River with the rest of Lake Havasu City. The area surrounding the bridge is understandably themed as that of an English village. James from Six Speed Blog and I headed out in our luxo-rides around 9:30 in the morning. This week, his test car was a 2015 Mercedes-Benz C400 sedan. I took my tried & true 2013 Acura ILX. Most of our drive was on hum-drum Interstate 10 which is always plagued with way too many 18-wheelers clogging up the fast lane, but a couple hours into it, we entered the back roads and things got a lot more interesting. 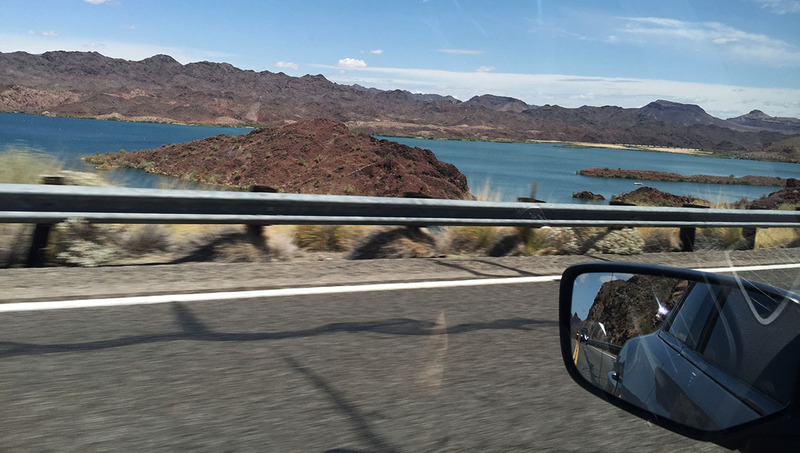 For about the next 90 minutes, Highway 95 ran parallel to the bright turquoise Colorado River. There were homes lining the river for most of the way, and we spotted a few boaters out enjoying the beautiful Saturday weather. 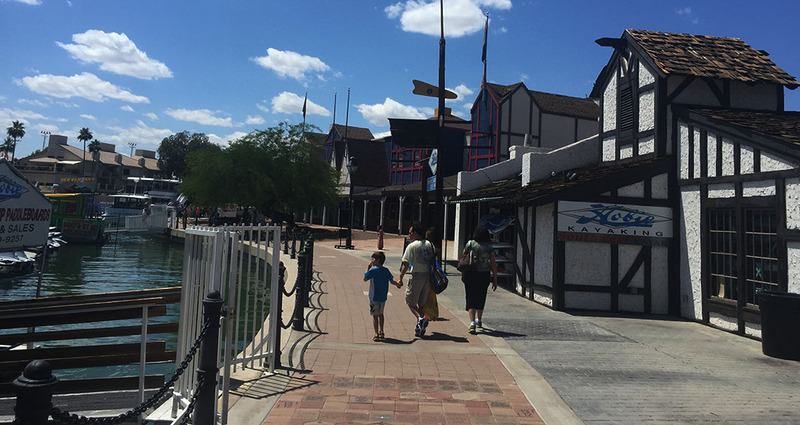 It wasn’t long until we closed in on Lake Havasu City. The name of the road which passes over London Bridge is (not surprisingly) McCulloch Drive, named for the man who purchased & reconstructed the bridge back in the 1960s. The first thing James and I wanted to do when we arrived in town was get some lunch, so I picked a top-rated (well, 4.3 out of 5-star) spot for us to check out, called Barley Bros. From our booth, we had a sweet view of the bridge outside. I went with a chicken club sandwich and James went for a “lobster burger,” but the thing we both raved the most about was the garlic cheese bread we got as an appetizer. The bread was so soft it almost melted in your mouth! There are shops, food trucks, and other vendors along the water underneath the bridge, so we hiked down a couple flights of stairs and wandered around a little to check out the area. 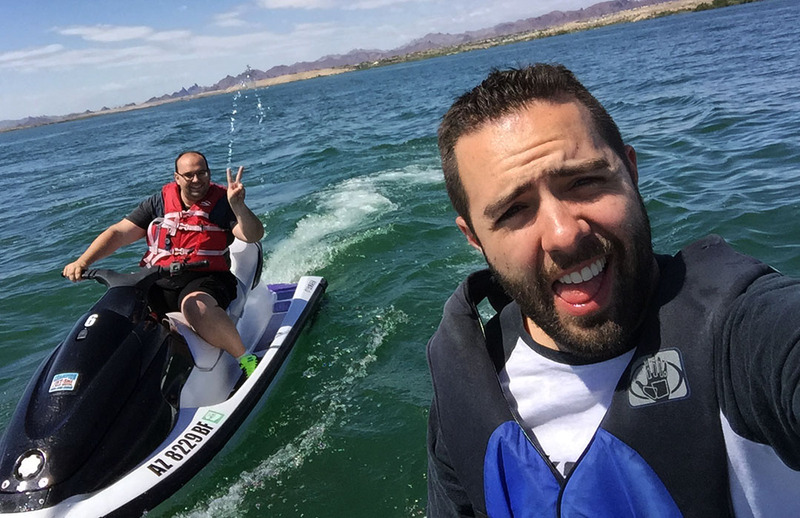 James spotted a jet ski rental place so we decided to try something spontaneous and check out the pricing. Champion Rentals offered pontoon boots and watercraft for rental by the hour. Jet skiing is something I hadn’t done for probably a decade and a half, but back in the day, my family spent a ton of time at the lake. Here’s a picture of me in summer 1997 at Lake Powell in southeastern Utah. And another shot of me (left) and my dad (right) following the boat. 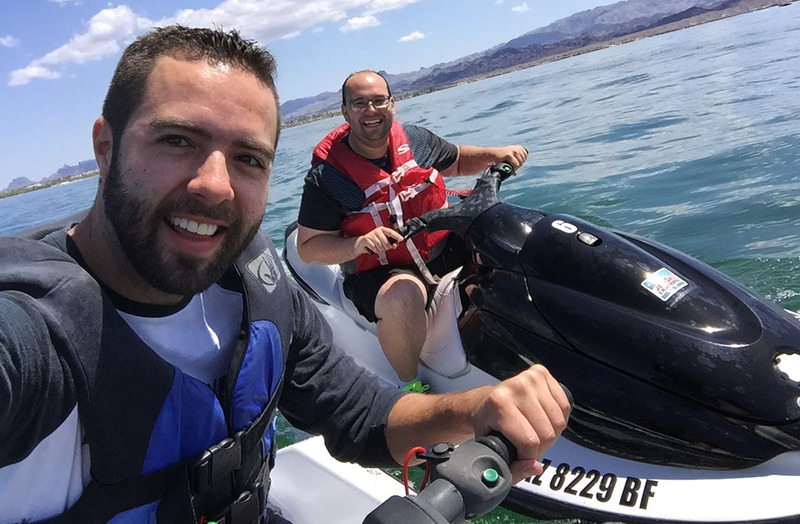 James had a little experience with personal watercraft too, and we both kind of wanted to have some fun. 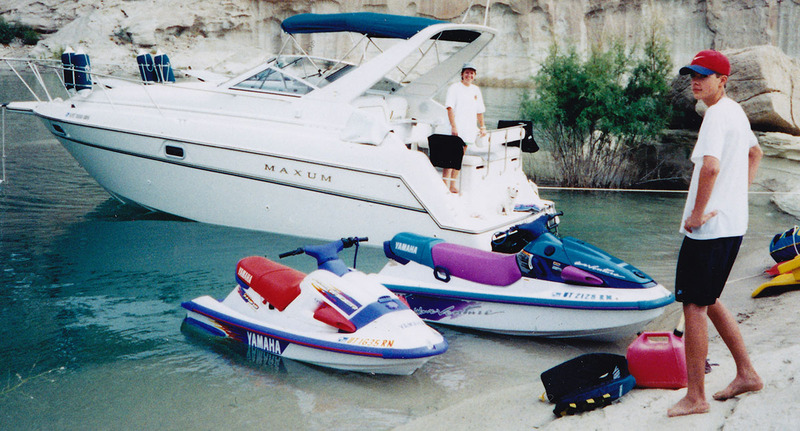 For $75 each, we plunked down our credit cards and booked ourselves on a couple of black & white Yamaha WaveRunners. I was surprised at how “little” training the owner gave – basically a few instructions on operation of the machines and a how-to on buckling the life vests, and we were off! It took us 10 minutes to idle our way out of the “No Wake Zone” in Thompson Bay but immediately afterward we hit the throttles and had a drag race. My WaveRunner somehow was a good deal quicker than James’ so I left him in my dust. Or, in my wake, rather. We had a lot of fun tooling around and got plenty wet in our everyday apparel – including shoes & socks which ended up being squishy and wet. After our hour of fun, we turned our watercraft back in and went back to the cars. We fueled up at a station called “Terrible’s” (not sure why anyone would name a business such a thing) and started our return drive to the Phoenix area. This time, I took the extremely posh Benz. Coming from a high-revving 4 cylinder to the Mercedes 3.0 V6, I was immediately blown away at just how refined the car felt at 70 miles per hour. It effortlessly floated along with zero wind noise. At one point I needed to pass two slow-moving semi trucks on Highway 95 and I discovered just how quickly the car can scoot! Its 329 horses are readily available to gallop. 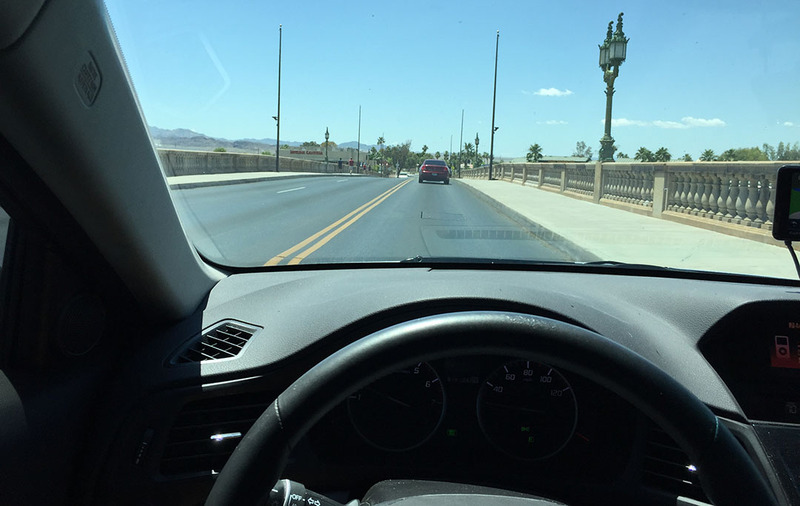 The head-up display made a handy way to tell current speed and direction at all times without taking eyes off the road. I had to chuckle when James pulled up behind me at a stop light and his iPhone bluetooth paired with the Mercedes’ radio and started playing his music. As soon as I pulled away at the green light, the music cut back out again. For the return trip, we opted for a little different routing. 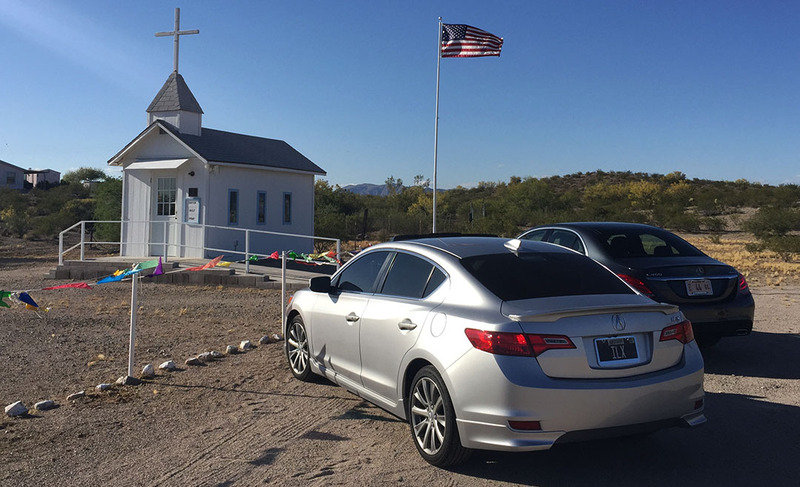 Instead of taking Highway 95 down through Quartzsite and getting on Interstate 10 from there, we headed southeast on Highway 72 through some rinky-dink towns like Hope and Salome. There really wasn’t much to see, but the seclusion and feeling of remoteness made it fun and the road had a bunch of whoop-de-doos. One 30-mile stretch between Salome and I-10 had at least 40 or 50 warnings painted on the pavement in giant block letters: “WATCH FOR CATTLE.” Since it’s open range out there, I’m guessing they have a high incidence rate of car-to-cow contact. I didn’t see a single cow in the whole stretch, however. 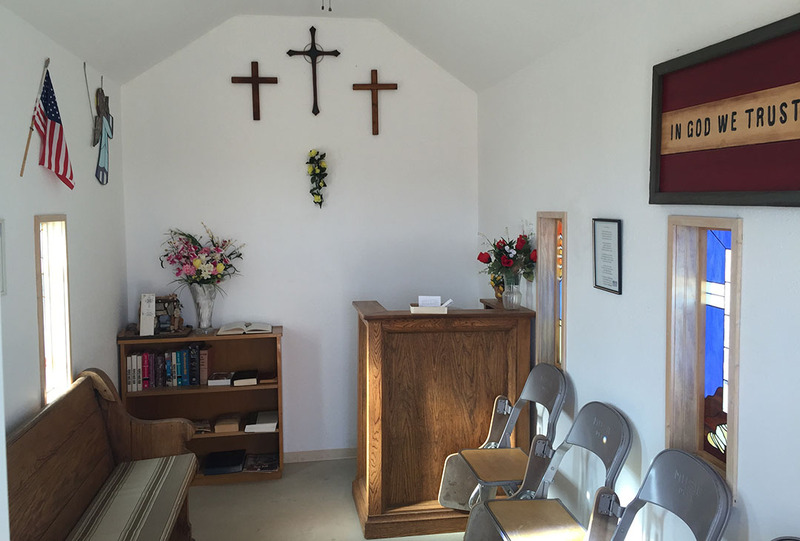 We did make a quick stop at a teeny chapel. This one was just a tad larger than the one I saw in Yuma back in September. 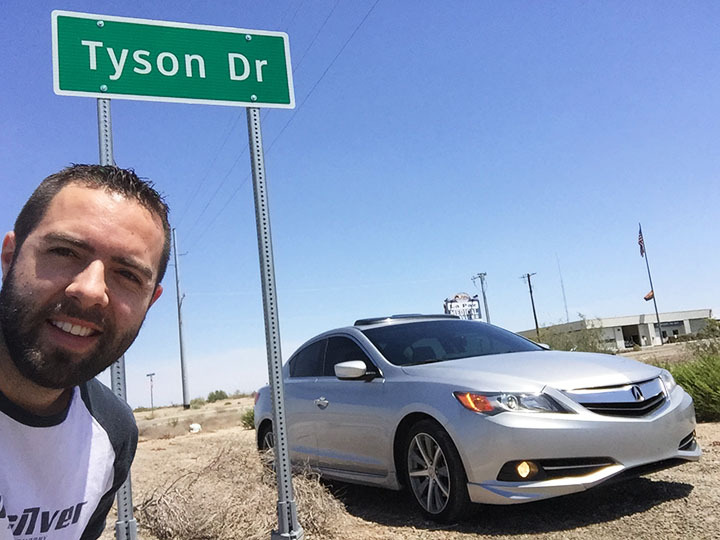 The day concluded with a memorable 125,000-mile milestone in the ILX. Next month, on June 12, I’ll celebrate my 3-year anniversary with that car. Hard to believe how quickly the years (and miles) have flown. Thanks for being a part of today’s drive and I look forward to having you along for many more in the future. Below are the rest of the pictures and a short video. Hey! I think I found out where I need to build a home! 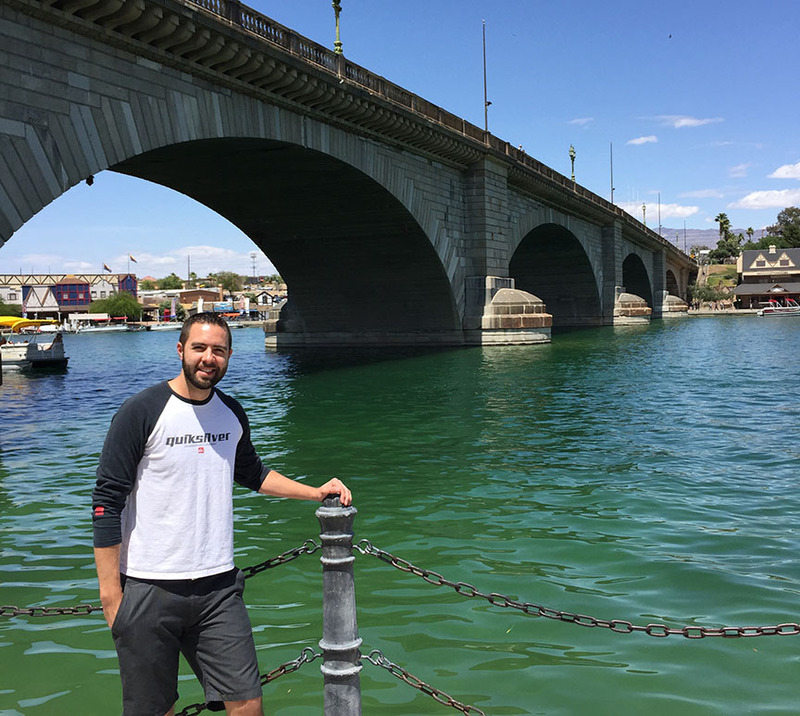 Welcome to Lake Havasu City! “Play Like You Mean It.” Ha! It’s no wonder Havasu is such a hot-spot for spring-breakers. Driving across the London Bridge. I wonder if even those light fixtures are original? Peeking out toward the mighty Colorado River. 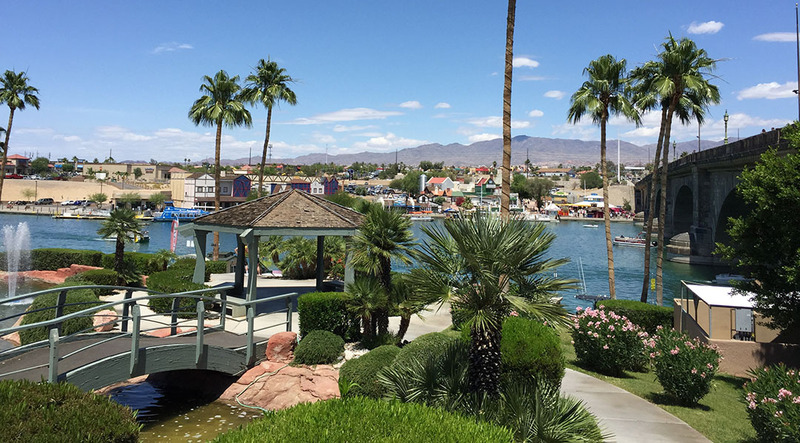 Lake Havasu City is a true oasis. It’s nothing but barren Mojave Desert in every direction. A good look at the bridge from the south side. 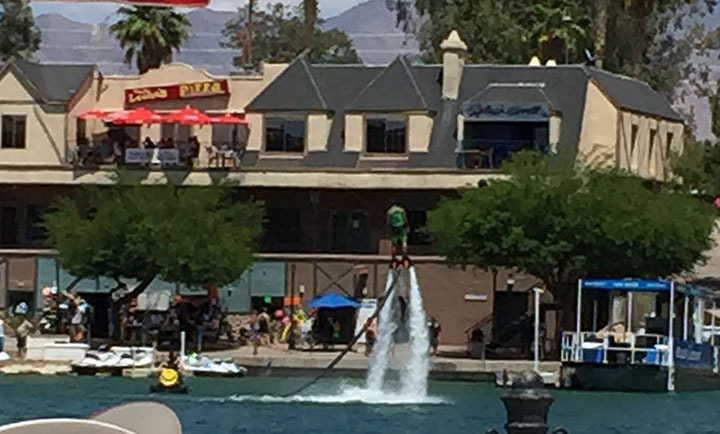 We saw this guy doing acrobatic tricks on some crazy looking “water jet shoes” of some sort. 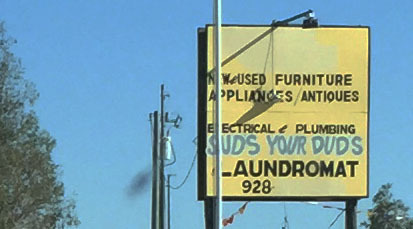 “Suds your Duds” Laundromat near Bouse, Arizona. We did sign the guest register! 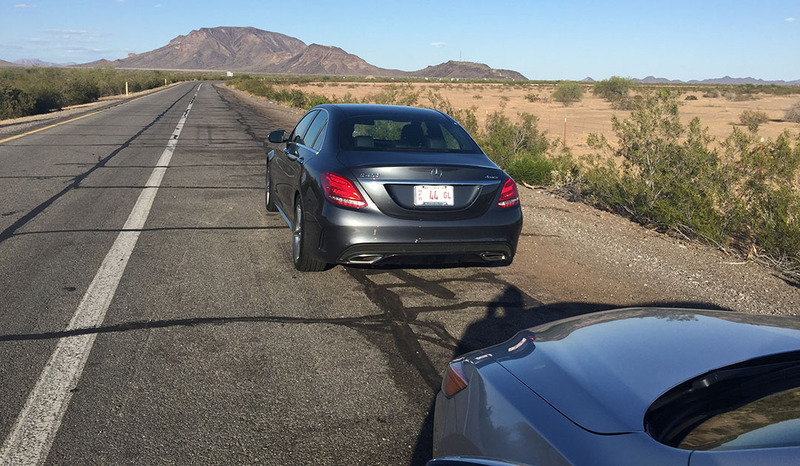 This entry was posted on May 11, 2015 at 6:38 am and is filed under Arizona, ILX, Road Trip. You can follow any responses to this entry through the RSS 2.0 feed. You can leave a response, or trackback from your own site. I love Lake Havasu, every year we make our way down to a huge car show there in October called Run to The Sun. It draws in thousands of cars and has been a staple trip for our family for a few decades now. Oh wow, that sounds like a riot! I wish October wasn’t already looking so crazy for me, but after some research, this year’s Run to the Sun show runs the 21st-25th and I do happen to be free on Saturday the 24th… let me know if you’re going. I’ll meet you guys there! Awesome! Looks like a relaxing trip. Thanks Nate! Yeah it was. Now I know where to find a refreshing escape from the heat when it gets to 120 degrees around here. Hahaha! “Terrible’s” gas station. I’d like to hear the history behind the name. That reminds me of a time when I saw a restaurant called “Human”…. Not exactly the best name for a restaurant. I know, seriously. I hope the fuel was good quality at least. I did a little research and the company was founded in 1959 but only has stations in NV, CO, UT, and AZ. Your ILX is about to overtake the mileage in my 2005 Acura TSX. I am at about 125,300. Give me 2 days, Carlos. I’m about to leave you in my dust. You’ve found water again! Nice work, sir. Ty, first of all, awesome and inspiring blog! I’ve been reading your blog from time to time and I’m amazed at how reliable our vehicles are (just traded in ’04 RX-8 for a ’14 TSX SE). 2. I remember awhile back you mentioned about how you normally do your own car wash and not let the dealer do it (besides that time on your ILX!). 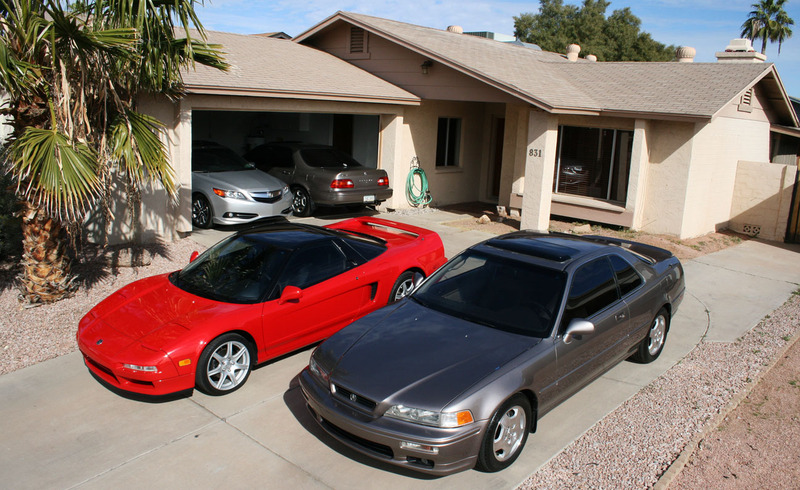 And because you maintain your vehicles so well, I was curious about what kind of products you use for exterior and interior care and how often you treat your cars (inside and outside). It would be awesome if you could share your wisdom in maintaining your vehicles! P.S. have you had any touch-up paint done in the past? Hello, and thanks for reading/commenting! I love the TSX SE and it’s a great car. Hope you are enjoying yours. 2) Every once in awhile I will have the dealership wash the ILX when I take it in for an oil change. Generally I do all the cars myself though. I like Meguiar’s Step 3 Carnauba wax, by hand. I use Meguiar’s Xtreme tire gel (smells/looks like grape flavor), and non-ammonia Windex for windows & wheels. Hope that helps. Simple cleaning does the trick!! Thanks! nice little trip! The jet water shoes are really cool to try out. I used them down in Cancun last xmas break. Can’t wait to try them out again. I was wondering what those things are “officially” called or how much they cost. Looks like a riot! I’m sure I would be spinning uncontrollably, haha.